A new Children's Hospital tower will kick off a decade of UIHC renovations. One of the country's top children's hospitals is about to get even better. In a February meeting, the Board of Regents, State of Iowa, unanimously approved the design and budget for a $270 million UI Children's Hospital tower that will accommodate more patients and consolidate pediatric care in one area of the hospital. 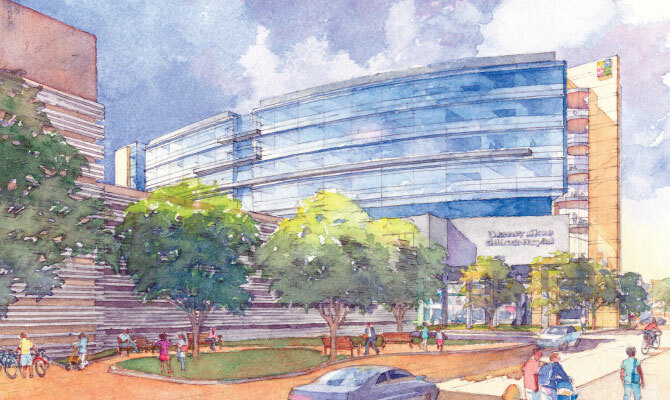 Part of the UI Hospitals and Clinics' ten-year, $1.1 billion facilities master plan, the new Children's Hospital begins construction next year and is targeted for completion in 2016. "The new hospital brings all our services under one roof and brings patients into a child-friendly environment," says Tom Scholz, 88R, 91F, interim head of pediatrics and physician-in-chief at UI Children's Hospital, which ranked highly in several specialties in the U.S. News & World Report's rankings of the nation's children's hospitals. "It creates a family-friendly environment, which has been proven to lessen stress, speed healing, and improve outcomes." The 12-story tower will be built between Hospital Parking Ramp 2 and Pomerantz Pavilion, connecting with Pappajohn Pavilion on its west side. The addition will allow the medical surgical inpatient, neonatal intensive care, and pediatric intensive care units to increase the number of patients they serve from 164 to 195 children. With 371,600 gross squarefeet of new construction and 56,250 gross square-feet of renovated space, the improved Children's Hospital will also include pediatric operating suites, playrooms, classrooms, outdoor space, and family support amenities. These improvements will help the hospital staff handle pediatric inpatient admissions that have risen by nearly 20 percent over the past five years. The hospital first received approval to start planning the tower in 2008, though a struggling economy kept the project on hold until now. A combination of healthcare revenues, hospital bonding, and private gifts will help pay for the overhaul. In addition to the new Children's Hospital tower, the hospital will take on a variety of projects from its facilities master plan in the next decade. The renovations will provide more operating room space, improve parking and navigation, move certain clinics and ambulatory care offices off-campus, and convert all patient rooms to private rooms. Plans also include up to $40 million for proton beam therapy, $45 million for orthopedics clinical and research facilities, a $63 million renovation of Colloton Pavilion inpatient units, and $400 million for a new patient beds tower. Hospital officials say such improvements will enable the hospital to stay up-to-date with the latest healthcare advances, all while meeting the needs of today's patients and families.